I took a photograph of an old map poster on a public building in Gresten. I identified every farm I looked for, and with very few exceptions could not identify a new building location! Note that the routing of the main road from Gresten to Ybbsitz has changed from this date. In particular, instead of running to the north of the Ober Haselbach farm, today Route 22 runs just south of the Haselbach farmhouse. Traces of the old roads can be detected in the aerial photograph. 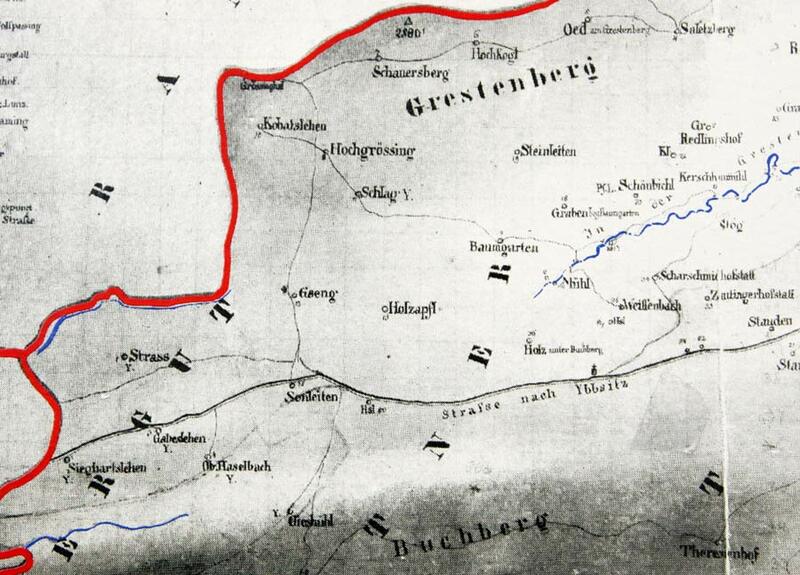 I believe the "Y" attached to some of the farms on the west indicates they belong to the parish of Ybbsitz.